She weighed 8 lbs 9 oz & was 20 inches long. I woke up on Tuesday morning to mild but semi-regular contractions. But, at 10-12 minutes apart, I had awhile to wait. I was 3-4 cm dilated two weeks earlier at my OB appointment. I didn’t get checked every week because all it does is stress me out and it doesn’t really predict when labor will start. But, that Tuesday felt like the day. I sat on my birthing ball all day long, because I had a gut-feeling that the baby was posterior. I had an intense pressure in my lower back. And I had not progressed as quickly as I did with my last labor so I thought maybe the baby was sunny-side-up and stuck. I did a lot of different things to “spin my baby”. As the day went on, contractions stayed about 10 minutes apart — some closer, and some farther apart. Late in the afternoon I called to see if I was to call when they were 5-7 minutes or 3-5 minutes since it was my third birth and things are unpredictable. I didn’t want to bother someone on call if I needed to wait longer — but I didn’t want to wait too long either!! The nurse called the midwife, who said I could come in whenever I felt like I needed to. But, the nurse wasn’t convinced, because she called the midwife back and then called me back to tell me that since it was my third, I really needed to go get checked because my contractions might never get closer together. She knew what she was talking about — because they didn’t. I went in for a non-stress test that proved that my contractions were 10 minutes apart and baby was fine. At that point, my contractions were actually getting stronger and more difficult to walk/talk through. But, it was 5 pm, and I was hungry. The midwife told me I could go home and come back when I was ready to have a baby. So, I did. My husband took me to McDonald’s for a McFlurry and french fries. Because, you know, I needed good healthy food to fuel my labor…. right? It was comfort food. I was terrified of laboring with a broken leg. I was also terrified of running into issues if the baby was posterior. I wanted a drug-free natural labor, like my second and NOT like my first. I didn’t want anything to complicate that. When I had myself mentally prepared, we grabbed my bag and headed back to the hospital. I ended up with the nice big room in the back corner — one perk of leaving the room I was in earlier to go home for a little while! I was 6 cm dilated and contractions were 10 minutes apart when I was admitted. The midwife said she could break my water at any point to get things to speed up, but I wanted to hold that option for later if labor stalled. I called my labor coach (who is studying to someday become a doula, but isn’t technically one yet!) and she agreed to come out. The nurse asked for my birth plan. I was surprised because I don’t remember being asked during my other births. My husband proudly presented her with my nerdy document equipped with itemized bullet points. I was very skeptical that anyone would read the plan, let alone take it seriously. I was very impressed with the staff because they followed all of my requests, to the letter! The doctor was slightly hesitant to not administer Pitocin immediately after delivery, but I won her over in the end. I really wanted to have an active labor, and avoid laying in bed at all costs. I had laid around enough the last four months with my broken leg!! I tried sitting on the birthing ball – which was more than awkward with my leg in a boot. I still had that intense back pain and the ball did help alleviate that a little. Plus, my friend massaged my back while I was on the ball and that felt great. I was much more comfortable in my hospital bed, though, even if it went against all of the dreams I had of walking the halls to get my labor to progress. My contractions hurt more and more as the night went on, but never got closer. My blood pressure was high the whole time, so they did some bloodwork to check for pre-eclampsia. Everything came back fine, though. I was offered to have my water broken again but I was able to get short 10 minute naps between contractions and I was tired. I didn’t want labor to speed up and then to spend the next day with family, friends, and my new baby, being sleep-deprived after delivering in the wee hours of the morning. So, I decided to wait until morning to try any interventions. I was most comfortable with pressure on my forehead and someone holding my hand. Weird, but whatever makes you comfortable, right? I sipped on lemon lime soda and water all night. Towards morning, I started to feel more and more nauseas. I was trying to breath out of my mouth and focus during contractions, and the mouth breathing just made me more thirsty. I desperately wanted to take a drink, and I desperately did not want to throw up. I told the nurse and she offered an IV anti-nausea drug which I accepted. And I felt great after that. I’m so grateful for my friend attending my labor! She stayed up with me all night long while my husband slept. Which sounds like he got the easy way out, but she left right before 8:30 am and that’s when everything started. When the morning shift change came, the doctor on duty for the day did my exam. I was 6 cm dilated. Still? After all those contractions? What?! My last labor was only 4 hours!! What was happening?! I agreed to have my water broken, hoping things would speed up. We took off my boot, so it wouldn’t get covered in the various bodily fluids that accompany delivery. The best news of the day was the doctor announcing, “You’re water is clear!” No meconium. No whisking my baby away for suction and testing. Thank you! She reminded me that if I had excessive bleeding after delivery I would need Pitocin. I explained that I understood that and just do not want Pitocin administered for no reason. No need to make those after pains any worse than they need to be. My worst fear was that someone would grab my now unprotected broken leg, yank it back for that “optimal” delivery position, and break my ankle all over again. Everyone files into your room to help with delivery. I felt like there were nurses everywhere. And, right on cue, a nurse that hadn’t been in my room at all so far, grabbed my left leg and pulled it back. “Don’t do that! !” My husband, the doctor, and I all yelled at the same time. The poor nurse. I’m sure we scared her half to death. The doctor turned around to finish getting dressed up for the occasion. “Don’t push yet, or the baby will hit me in the back of the head,” she joked. My husband appreciated the humor a lot more than I did at that point. Not pushing is the hardest thing in the world. I spent so much energy not pushing that I was a complete mess when it was time to push. Between screaming, “I can’t!” and trying to breathe when they wanted me to, I was all over the place. This is when I needed my doula!! My last baby was born in one big push. I wasn’t prepared for all this! I heard the doctor say, “She’s holding back.” Then, she coached me through a few more breaths. I composed myself and did a lot better with the next contraction. “It’s a girl!” the doctor exclaimed. I think the hospital staff was just as excited as we were to find out the gender of our baby! “A girl? !” I said. We were convinced it was a boy because the heart rate was always so low. For the first time ever, I got to hold my baby just seconds after birth. The baby was posterior, and that’s why I was stuck at 6 cm for so long. Breaking my water allowed her to descend and forced me to dilate to 10 cm VERY quickly. Her little nose was squished to the side for a few days from being stuck in there backwards for so long! What a cutie. My doctor said, “You don’t need any stitches! And you’re not bleeding so, for now, we will skip the Pitocin.” I hate Pitocin. I will do anything to avoid it. Thankfully, I didn’t need it, but the nurses and doctors were skeptical up until the day I left the hospital. “Can I nurse her?” I asked. I wasn’t sure if they had cut the cord yet or not. “Can they nurse that early?” the doctor asked one of the nurses. Seriously? Yes. Baby Gracelyn rested happily at her mama’s breast. And we both rejoiced in our accomplishments. Day 6 Recap: Since I took a day off from laundry on Day 5, I was worried about running out of diapers on Day 6. But, I have 12 FST and I had not cut up my flannel sheet set yet. Then my husband told me that the kids were going to my in-laws for the night… and I’m not asking them to participate in my handwashing challenge!! 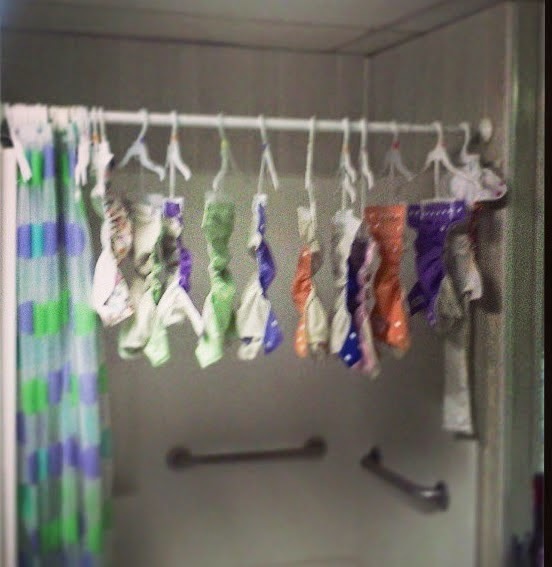 So I have two clean flats left for Day 7 when everyone comes home and the rest of the diapers are soaking. Overall Experience: What did you learn? Would you do it? Overall, this wasn’t very hard! I could totally do this every day if I were home full time. I could do a much better job of it if I had use of both of my legs, too. If only I could have used my clothesline to sun some diapers!! I really like reusable covers. They cut down on diaper laundry dramatically. I would much rather wash 5 FST and 2 covers (only 7 pieces from 5 changes)– when I double stuff my pockets, I would have to wash 15 things for those 5 changes!! I will just need to find somewhere else to hang my covers between uses when I don’t need my walker anymore! Diapers clean up much more easily when they are soaked. I might use the soak cycle on my washer instead of the rinse to start off the laundry — or maybe I’ll soak the diapers in the pail for a bit before tossing them into the washer. I love the spin cycle on my washing machine. Wringing out diapers well enough so that they would dry inside was probably the worst part – and it wasn’t even difficult, it was just a pain. And, it could be because of my leg. By the end of my washing routine, my foot was swollen and my ankle was hurting and wringing out diapers was the last thing I wanted to do. But nonetheless, I miss my spin cycle. Would I do it? Yes! I will definitely take my FSTs and covers on our next camping trip. I will definitely use more flats & covers in our rotation. I loved washing diapers with Raegan. I loved how excited she would get every time we walked into the laundry room. I just hope she gets this excited about the other chores I show her as the years go on!! I will definitely be participating next year!! Day 1: Why Are You Taking the Challenge? Day 2: Show Us Your “Stash” and tell us what did it cost? Day 4: What is your Washing Routine? Day 5: Flats Experience- Folds you love, Are they working, etc. Day 7: Overall Experience, What did you learn, Would you do it? Day 5 Recap: I am tired. But, it really has nothing to do with the challenge. If anything, the challenge has kept my mind off of how miserable I am. But, last night my ankle hurt. And, we didn’t have any #2 diapers on Day 4… then Day 5 more than made up for it. So, I took a break. Handwashing on one leg is tough. And this mama needed a day off from laundry. A lot of mamas use diaper sprayers to clean off diapers before tossing them in the diaper pail or wet bag. I’ve also read a lot of bad reviews about diaper sprayers… I have a giant bathroom/laundry room on my first floor where I keep my diaper pail. Luckily, the shower is right next to the toilet, so I can use the hand held shower head to spray off stubborn diapers. But, that poses quite difficult on one leg with crutches. So, since I became less mobile, I resorted to the “dunking” or “sloshing” method… which is basically to splash the diaper around in the toilet and flush until it comes clean. It’s a longer process, but it works. 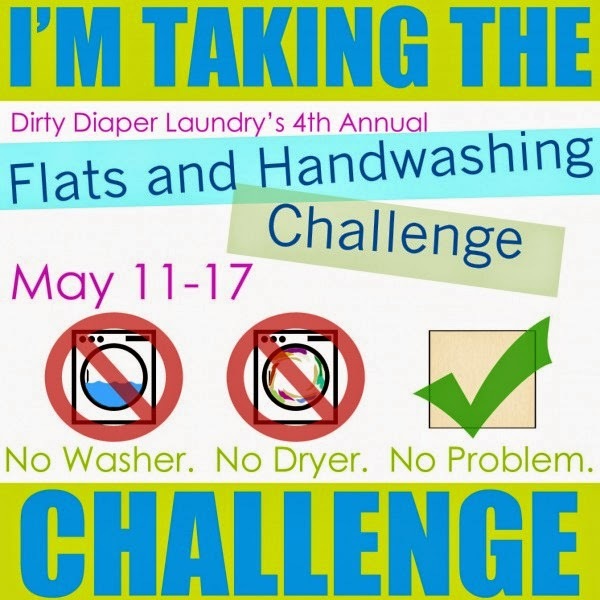 A very nice lady named Heather Lucas in the Flats & Handwashing Challenge Facebook group offered me a ScrubADoozy to try out during the challenge. I had never heard of a ScrubADoozy, but I was looking for something new! A ScrubADoozy is basically an in-toilet washboard to assist in the dunking/sloshing process. Installation was a breeze. With some plain old 3M adhesive, I stuck the ScrubADoozy to the front side of the toilet bowl (which was actually slightly complicated, because I never realized how contoured the inside of my toilet bowl was!). I let the adhesive dry as long as I could — not the recommended 12 hours, because I’m pregnant and this is the only toilet I can access on my crutches. But, it’s holding up well, and if anything happens, I will get more adhesive and try again when I’m not limping and not being kicked in the bladder. One of my biggest challenges with both spraying and dunking was getting the leg elastic clean on the covers. No matter how much I dunked or what angle I sprayed, the elastics just never came perfectly clean. With the ScrubADoozy I rub each side of the diaper on the washboard and everything comes off! The washboard comes clean very easily with a single flush. So easy! 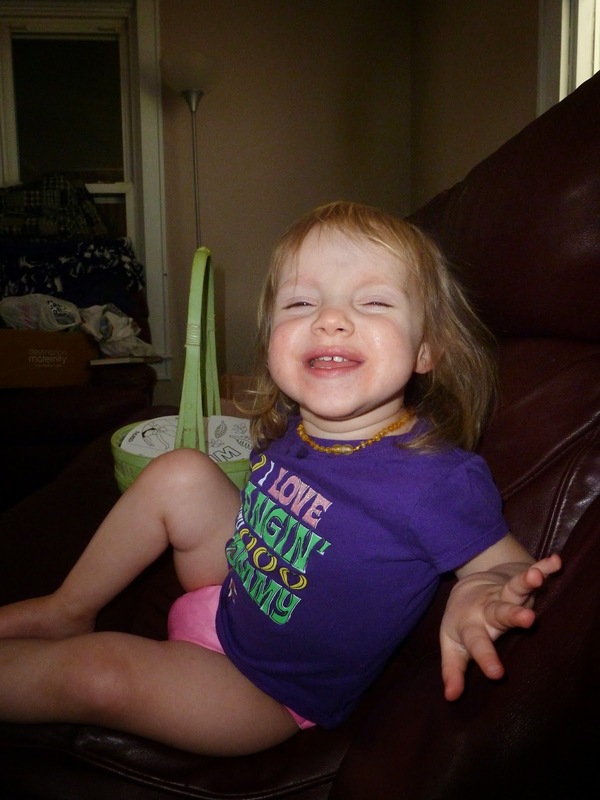 Day 4 Recap: Washing at night is a lifesaver, but it broke my little girl’s heart! The diapers were all dry by the time we woke up (7ish)! But, when Raegan got up and started moving around, she brought me the plunger and my Buncha Farmers stain stick and said, “Coming, Mommy?” I didn’t realize it had already become part of her routine. So, I made sure I washed the diapers before she fell asleep last night. My Flats Experience: Folds I love & How they’re working. We haven’t been too adventurous with folds. I can’t get the FST to fit correctly inside the covers unless I use a pad fold. And I don’t really do an “official” pad fold either. I fold the FST into quarters then I fold both sides into the middle and fold the whole thing in half. I just lay that in the center of a cover and snap her up! When I do any kind of wrap-around-snappi set-up, the sides stick out of the cover and cause leaks… no matter how much I jellyroll. The only fold I have really used is the Happy Anteater. I tried the Origami fold, but the wings were just too big, so I like the modification on the Happy Anteater. This fold gives me that extra absorbency in the middle like a pad fold, but allows me to use the FST without a cover. So, on the second day of the challenge, when my laundry wasn’t drying nearly as quickly as I thought it would, we used some FST without covers until the laundry was done. Raegan doesn’t seem to care which style she wears. But, it is sort of difficult to fold a large flat in any creative way while I’m stuck sitting here on the couch. She gets impatient waiting for me to tweak and perfect the flat. If I was more mobile and could fold things ahead of time (maybe even iron them!!) I may be more inclined to use a fancy fold. For now I’m good with a plain old thick rectangle!! Day 3 Recap: I washed twice yesterday.. which goes along perfectly with today’s theme, “What is your washing routine?” I washed in the morning as soon as I got up so I could have my husband hang everything on the clothesline while we went to a doctor’s appointment. Then, I checked the weather and saw it was supposed thunderstorm at 8 am, so I hung everything inside again.. It didn’t rain. At all. So, when we got home (after I got my lovely pink cast), my awesome husband hung my laundry outside!! Drying inside is taking forever, but it’s supposed to rain the rest of the week. So I decided to do laundry before bed, so it has all night to dry instead of waiting all day for new clean diapers. I don’t think I could hand wash all the time, until my leg is healed, unless I figure out a way to get things to dry much more quickly!! Other than that, I really don’t mind it at all. Washing & scrubbing are my favorite chores. I love soaking my hands in hot soapy water. 2. After bedtime, fill pail with cold water, agitate for about 1 minute or until water is dirty. 3. Dump diaper pail, refill with cold water, add diapers and agitate again. 4. Dump again, treat any stains, fill diaper pail with hot water and add 1 tbsp detergent. 5. Add diapers, soak for 30-45 minutes. 6. 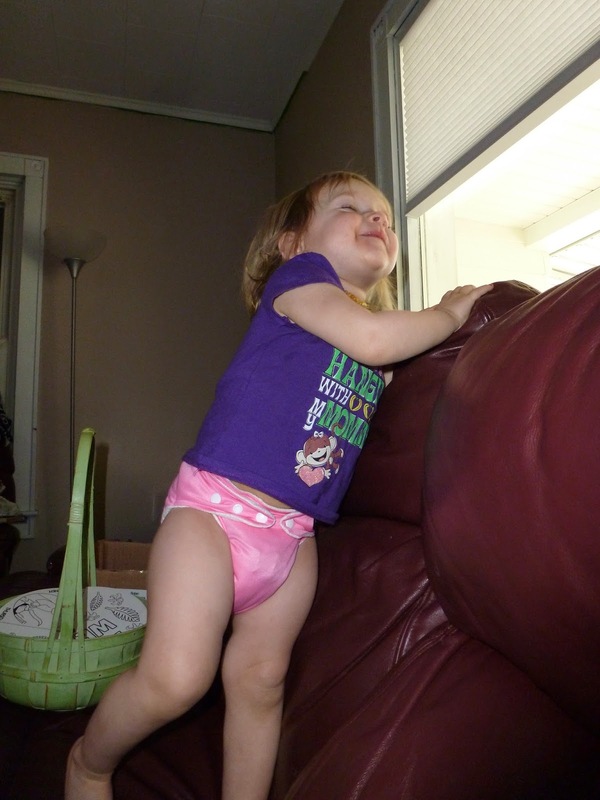 Agitate diapers by “plunging” for 5 minutes. 7. Dump diaper pail, rinse each diaper with shower head, toss back into diaper pail. 8. Fill diaper pail with cold water to rinse. Repeat if necessary, until soap is gone. 9. Wring as much water as possible out of diapers & covers. Hang to dry. I dunk & slosh any diapers that need it right away (more on this during Day 6! ), then toss them into the diaper pail. When I’m ready to wash, I fill the diaper pail with just enough cold water from the shower to cover the diapers. Using the plunger, I agitate the diapers until the water is dirty. Then I dump the pail into the shower and repeat. After the diapers are rinsed, I treat any stains with Buncha Farmers Stain Stick. Since the diapers are already wet, I just rub the stick onto the stain and then work the soap into a lather. 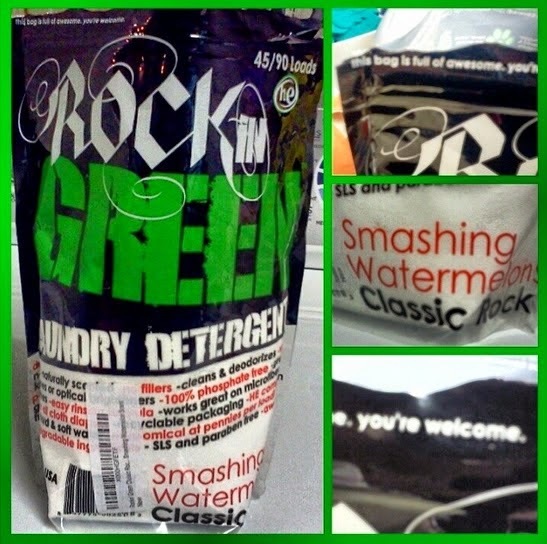 I toss everything back into the diaper pail, add 1 tbsp of Rockin’ Green Hard Rock (this is actually Raegan’s job), and fill with hot water. I agitate the diapers just enough to get the bubbles started and then I let everything soak for 30-45 minutes. After soaking, I use the plunger to get the diapers really clean. 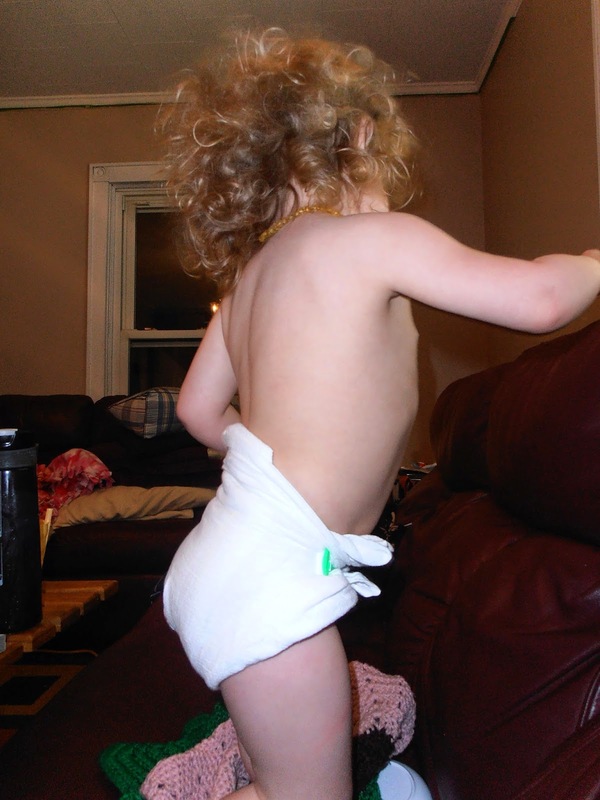 I do my best to “plunge” the diapers (helps pull the water through the fabric), but when my arms get tired I just stab at the diapers to keep them moving around. After 5 minutes, I dump everything into the shower again and turn on the cold water. I rinse each diaper with the shower head and toss it back into the diaper pail. I do two more rinses, just like the ones I did in the beginning, to make sure all of the soap is out. Wringing is the worst. I try to wring everything until it’s not dripping. I haven’t really found the trick to wringing out the covers, but the FSTs themselves wring out nicely. It’s just a lot of work. I’m glad there are only 4 or 5 diapers in the wash! My only wish is that I could use my clothesline, but it’s just too hard on one foot, especially with the threat of rain. I am using a drying rack I borrowed from my mom and I use pants hangers to hang diaper covers when needed. Sometimes I just drape the covers over the backs of the dining room chairs instead, because the dining room has a ceiling fan to keep the air circulating and dry everything a little faster. Day 2 Recap: I totally got caught up in my work yesterday morning and completely forgot to change Raegan’s diaper between 9am and 1pm. Oops. Then she fell asleep (and so did I) so she didn’t get changed until late in the evening. Good thing FSTs hold a lot!! I haven’t cut up my flannel sheet yet, because I can’t get to my sewing machine and I’m worried that the edges will fray too much before I get a chance to serge them. This fall, Raegan ended up with a terrible rash. Every time she had a BM, it practically ate her skin away. I’ve seen other moms call it “battery acid poo” and that’s an accurate description. We tried Desitin. We tried A&D. The poor girl would get these blisters and as soon as I wiped her to clean her bottom the blisters would break open and bleed. It was so bad that I took her to the doctor to get it checked out. The doctor assured me it was a yeast rash, which I had never heard of, so I started researching. We tried prescription cream. When that didn’t work, we went back to the doctor. We tried Aquaphor, which actually worked for a short period of time. We tried coconut oil with a splash of tea tree oil. Then I came across CJs BUTTer Spritz o BUTTer Plus . It’s designed specifically for yeast rashes, with all natural ingredients. I got a tube of regular CJ’s Butter first, because the store I ordered from was out of the PLUS formula. The regular stuff worked. It at least kept the rash from getting any worse. But, as soon as the CJ’s Butter PLUS Spritz arrived, her rash was gone. I swear by the stuff. I like that with the Spritz, I don’t have to actually touch her rash (so no more irritating those blisters). The Spritz also has lasted us a lot longer than the tube of cream because it’s easier to control how much you use each time. And, the smell of the PLUS formula is strong but not bad. It’s better than the fishy smell of Aquaphor. But, the best part was that CJ’s is cloth diaper safe!! 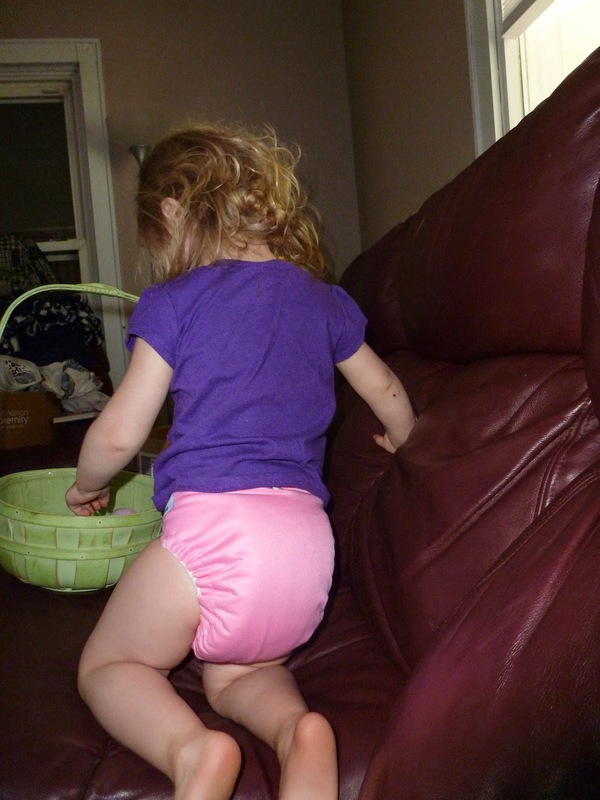 Just to be safe, the day care started using our cloth diapers and they restricted her diet a bit (no acidic fruit or juice, low fat milk). The day care even started using wet paper-towels instead of baby wipes! They were super helpful. She ended up getting another rash just last month when I broke my leg. 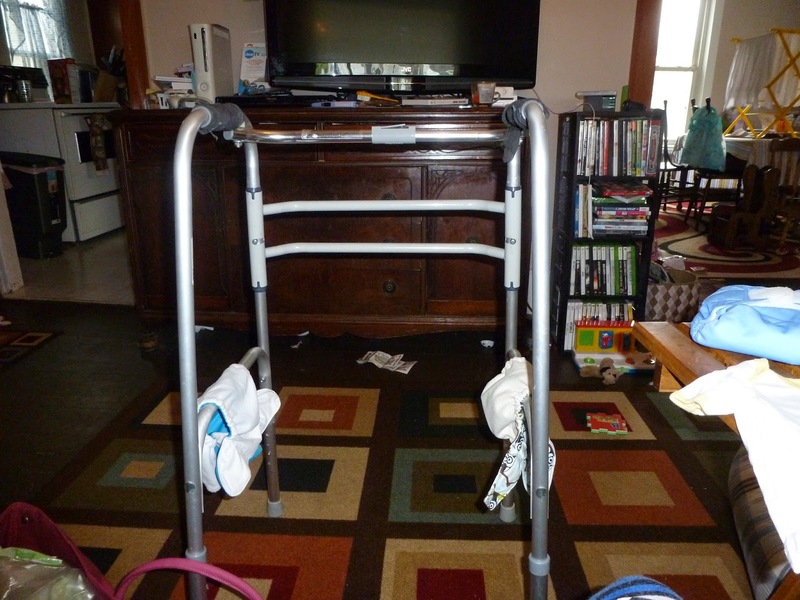 She was with family for a few days while I adjusted to life on crutches and she used a lot of disposable diapers. 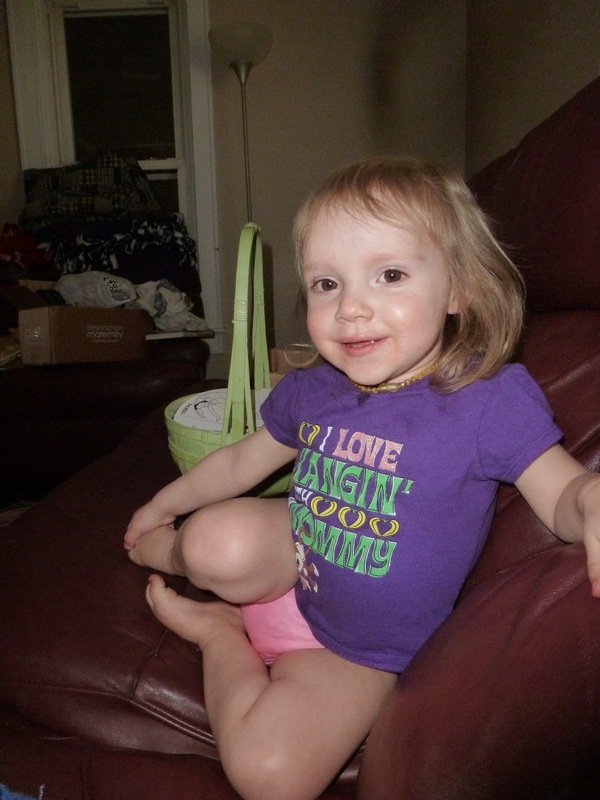 It seemed like her rash came back almost instantly, but a few days with CJ’s PLUS and it cleared up again. I use regular scented CJ’s Butter Spritz for normal diaper changes. We just finished out our bottle of Tis the Season, which smells like Christmas cookies! I have a bottle of Monkey Farts scented Spritz in her dresser, but I can’t get upstairs to grab it! The Spritz lasts forever! Monkey Farts has to be my favorite scent so far. Bananas & coconut. I also got some Pink Sugar scented Spritz for a friend and that was pretty yummy smelling. CJ’s has a ton of fun scents that I want to try…. Narwhales & Unicorns, Mango Sugar & Mint, Blueberry Crumble, Pixie Pie.. and then they have seasonal scents! Who knew cloth-diaper-safe rash cream could be so fun?? Day 1 Recap: Day 1 went pretty smoothly for all the running around we did. We went to church, my mom’s, my grandma’s, my MILs, and out for icecream. We actually only used 5 diapers, including our nighttime diaper. 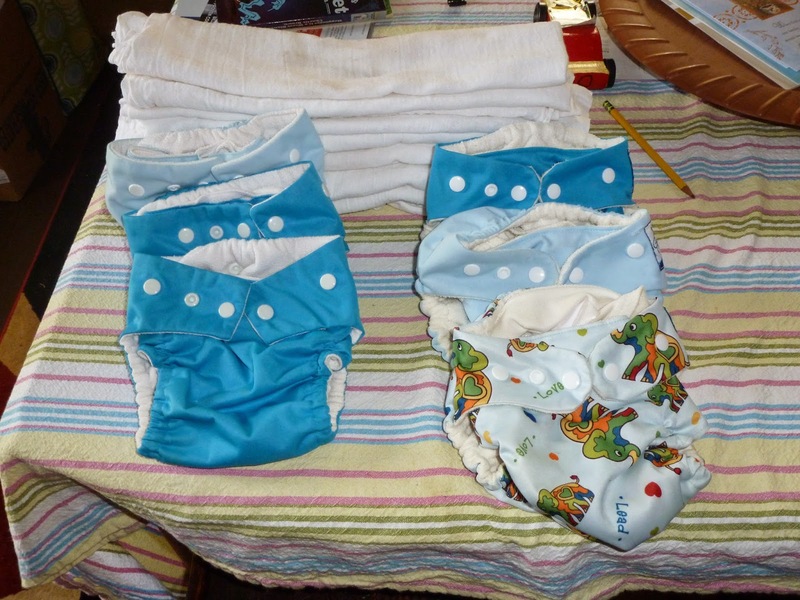 I had packed two pocket diapers stuffed with FSTs for family/friends to use for easier changes, along with a bunch of pad-folded FSTs and covers. If my leg wasn’t broken, I could easily just say, let me change her and use less covers that way – but I can’t, so I made adjustments. I have plenty of covers, so it’s not a big deal to stuff them and use them as pockets. Last night before bed, I rinsed off all of the diapers that needed rinsed and I put them in to soak for about 30 minutes. I’m washing in the morning today but I might switch that and wash at night instead. I have plenty of diapers and covers, so I could probably go every other day washing but I worry about them not getting dry since I can’t use my clothesline while my leg is broken. I have 7 8 SoftBums shells, all purchased used from the SoftBums B/S/T group on Facebook (except one I bought last week from Eco Baby Boutique). I got some Omni and some Echo because I wanted to try both. I like that I can get a better fit with the Echo but the Omni can also be used as a pocket, which is the only type of diaper my husband will use. So they both have their pros. I’m using 12 flour sack towels as my flats. My husband picked these up at Sam’s Club for me for around $13 with tax. I washed them twice to prep them, because I read they shrink in the dryer and it really helps to tighten the weave of the fabric. We tested them out the last few week in the “pad fold” and they are working great. They are supposedly really easy to handwash as well. If I end up getting behind on the laundry (I plan to wash daily), I will use my pockets as covers and I will use tshirts as flats. I have an old flannel sheet set that I can also cut up into flats to use as doublers or just extra flats. So my official stash cost us $167. Maybe after the challenge I will post an update of my entire diaper stash! !